Thumbing through the December/January issue of Country Living, I stumbled upon these darling throw pillows showcasing old photos. 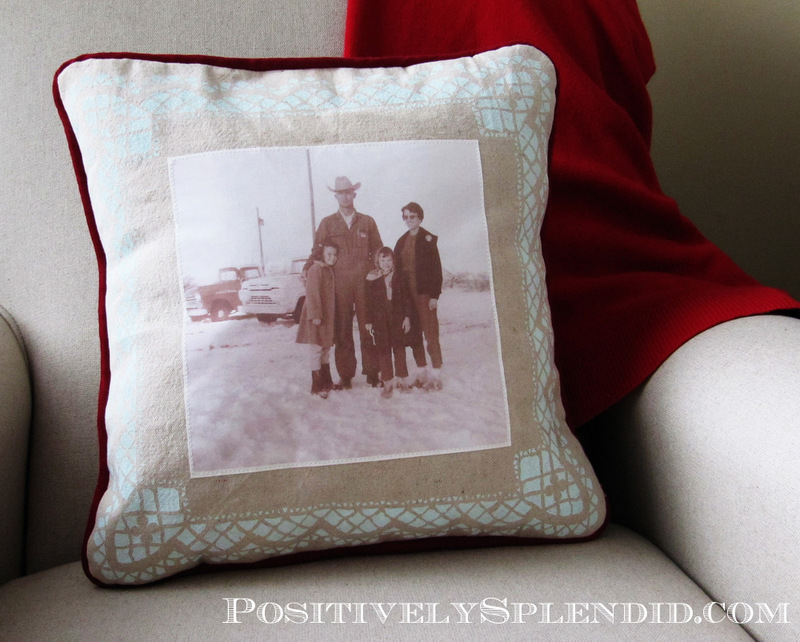 I loved the concept, and I knew immediately that these would make great, easy-to-sew Christmas presents! 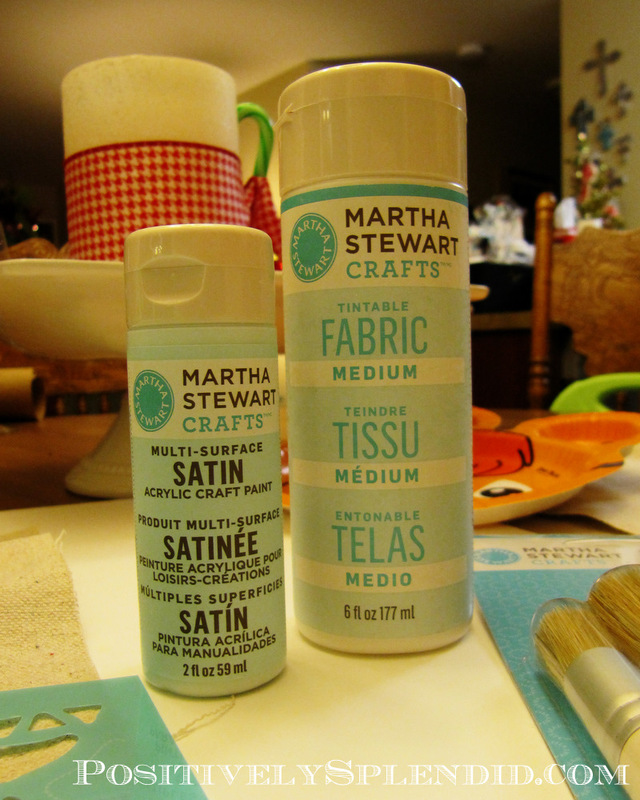 Some of you might remember the DIY Painted Tile tutorial I shared earlier this year using the new line of Martha Stewart paint products. I have to say that after using these products for the last months, I love them even more today than I did at the start. They are so versatile! (FYI: I am in no way being compensated to showcase these products in this post.) 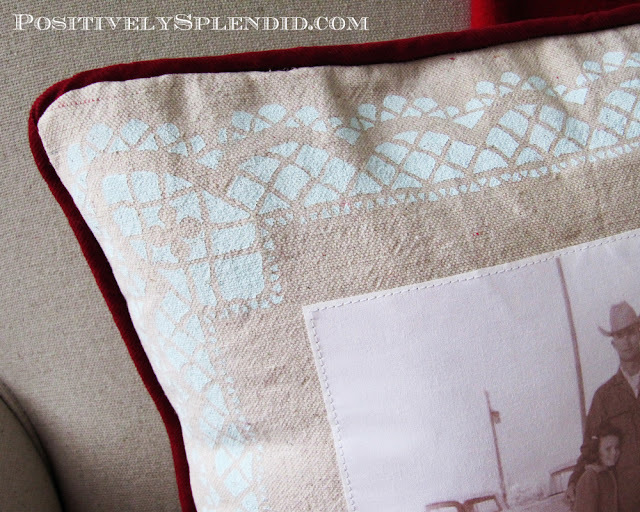 To add a decorative touch to these pillows, I used the satin paint and fabric medium from this line, as well as the stencil brushes (a terrific product!) and a doily border stencil from the Cathedral Lace stencil set. Note: The basic concept behind the construction of these pillows is the same as the one I used in my Freshly Squeezed Pillow Set from the beginning of the summer. (one) For a 16-inch pillow, cut a front panel piece from your canvas material that is 16×16 inches. Cut two back panels from your cotton ticking that are 16×11 inches. (two) Print your photo onto your fabric sheet in sepia (I edited mine using Picasa) using the instructions specified on the product packaging. 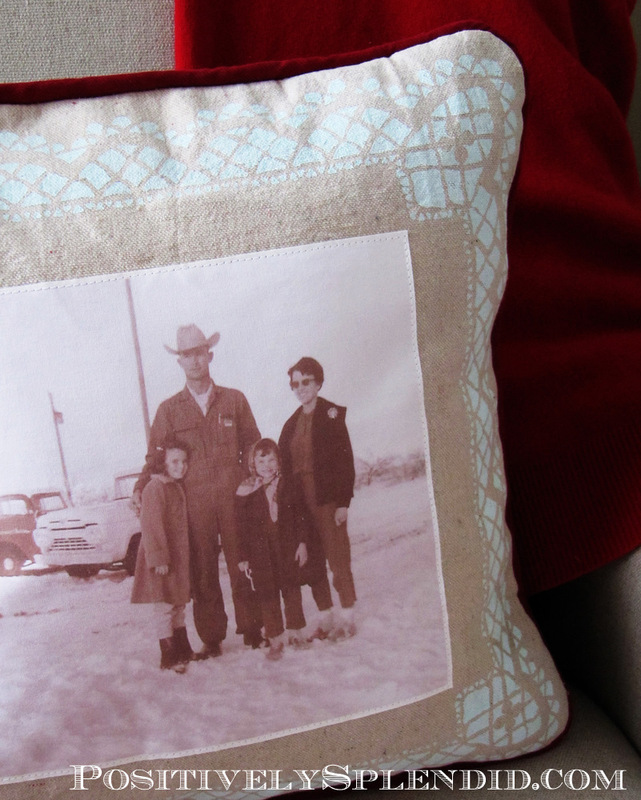 Trim your photo to an 8.5-inch square, and set it aside for later use. 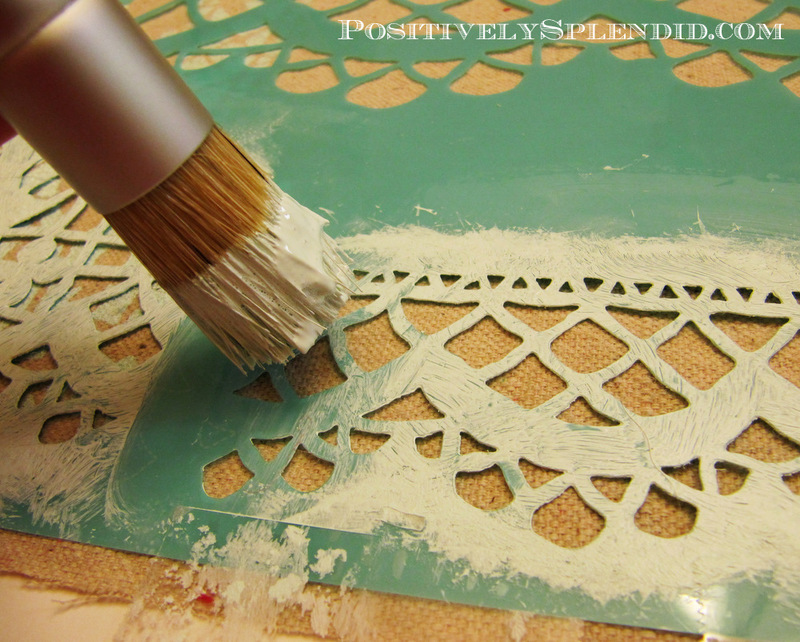 (three) Stencil a lace border around the perimeter of your 16-inch square canvas piece. Allow to dry completely. (four) Topstitch your trimmed photo fabric piece in the center of your stenciled border. 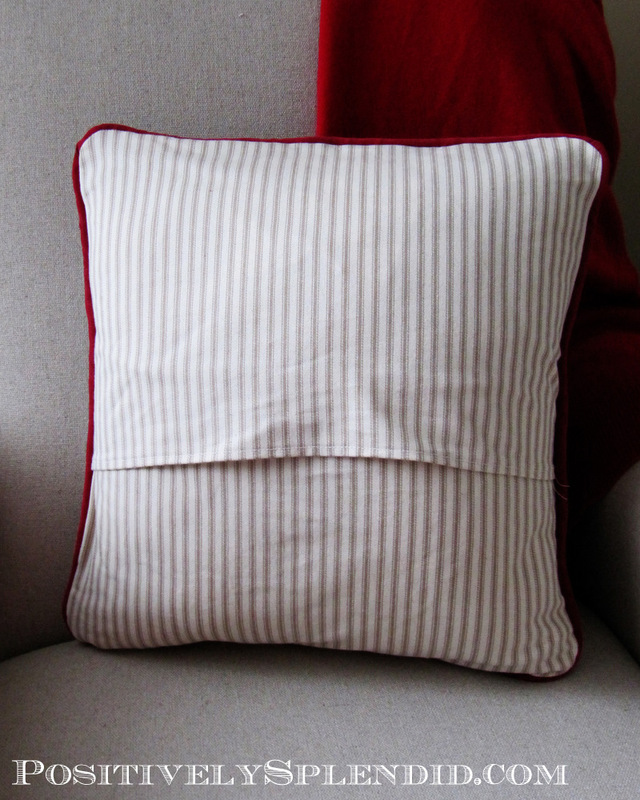 Note: I decided to use some piping, which I made from red corduroy I had in my fabric stash, to give the pillows a polished touch. If you are short on time, though, you could easily forgo that step. (six)Fold one of the long edges of your cotton ticking pieces down 1/4″; press. Fold under another 1/4″, and press again. Stitch to secure this hemmed edge. Repeat with your other ticking piece. With your completed pillow front face up on your work surface, lay one of your rectangle pieces on top, right sides facing, so that the corners and edges are all aligned and the hem you just sewed runs through the center of your front piece. Pin. Now, position your other rectangle piece one the bottom portion of your pillow front piece in a similar manner. Pin. Note: The hemmed edges of your rectangle will overlap by a few inches at the center of your pillow. If using piping, stitch your pieces together as closely to the piping as possible using a zipper foot or a piping foot. If not using piping, use a 1/4″ seam to stitch all the way around the outer perimeter of your pinned pieces. Clip your corners and turn your pillow cover right-side out. Your recipient is sure to love displaying this meaningful gift in their home! I love the crisp piped edges and the antiqued look of the stenciling on the canvas! Previous Post: « Soul-Feeding Sunday: Did She Know? How sweet Amy, I really like it! But I am also impressed that you could get anything made right now with a new baby. Hope you all have a Merry Christmas! 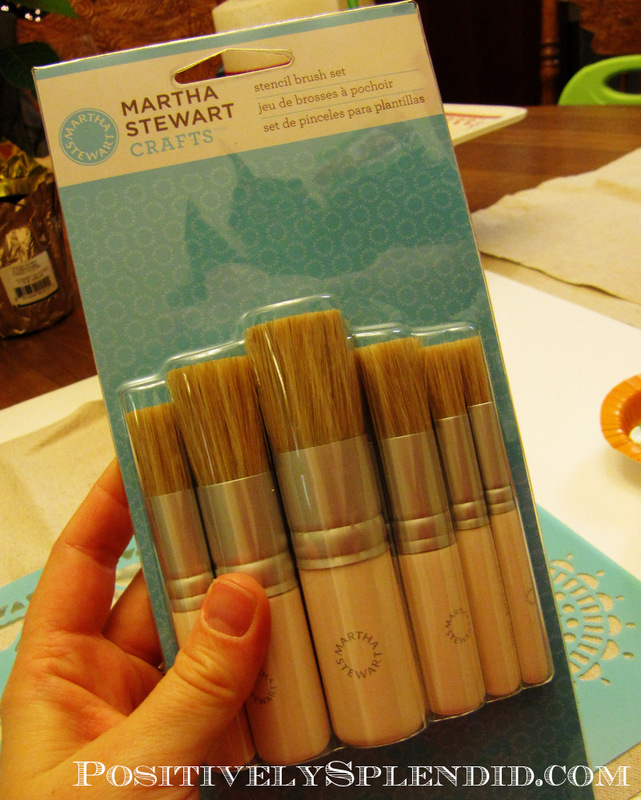 ThosE ARE SO CUTE AND will make such great presents. I will have to remember this idea for next year. Lovely idea; I’ve got some old family photos that I’d love to try this with. I have a muslin panel that I want to put on the face of a pillow. Did you just pin and stitch? Do you fuse it at all? Just turn under the edges? My muslin panel is a batik panel– I was wondering if I could just top stitch it, but leave the raw edges out, making it look a little more rustic? Ok….I totally love this project. Even though I don’t sew, I think I can do this, but I am not familiar with printing fabric pictures. This is new to me. Do I need a special printer and where do I get the fabric. Hi, Debbie! 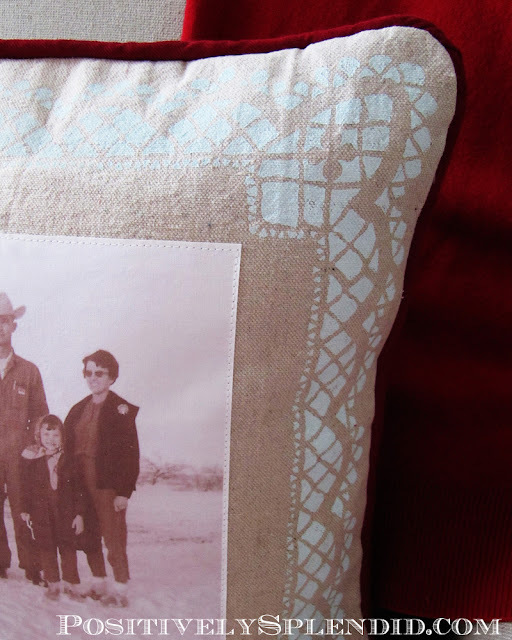 You can use your home printer, and the printable fabric is available at craft stores like Jo-Ann. Have fun!